Flame resistant for extra protection for you, your equipment and your charging location. Case style bag design provides a much easier to use solution over more conventional flat bag designs. Easy-to-secure hook and loop flap which will release pressure in the event of an explosion. 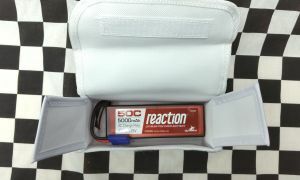 Use this fire resistant product while charging, storing or transporting a lipo battery pack. Never charge unattended. Always keep your lipo packs in a fireproof container. Replace if it becomes ripped, worn or is involved in a battery ignition. The use of a Lipo charge bag does not guarantee protection of surrounding surfaces. It is simply intended to mitigate the effects of a battery failure during charging or after a crash. 2nd photo shows a 4s 45c Lipo pack for display purposes only. Not included! 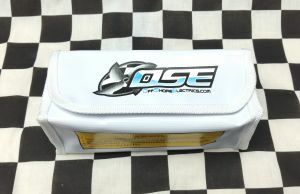 NOTE: Offshore Electrics Inc takes no responsibility for effectiveness of the lipo charge bag.